James, What a about a book about "The basics of painting" ? 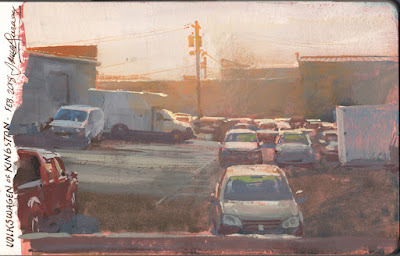 I love your backlit smoggy paintings. Well done again. I've thought about the extent to which modern photography has conditioned us to accept its limitations as representative of reality...in particular its narrow value range. For sure, painting value is limited vs. real outdoor light as well, but in photography you usually have to make a choice between detail in the shadows and washing out the highlights, or detail in the highlights and opaque shadows. Even though I'm not sure the human eye necessarily works that way, we have come to expect the same choice is what makes a painting successful as well. ScottT: Photographer Jed Anderson commented on Twitter: "My inclination as a photographer with a scene like this is to immediately go monochrome and focus on the values, due the lack of hue. But painting gives one so much more room to suggest colour in a restricted context. I need to use my gouache more." It's great to hear from a photographer, because I'm so inspired by Atget, Weston, Frank, Winogrand, and so many others. What I like is what they can do with the limited receptivity of the film stock. The problem with our eyes is that we see too much information, so we need to consciously simplify what we see. James, I suspect you're working toward a bigger project like Painting Atmosphere and Mood. One part of that that intrigues me are nocturnes where the values compress the other way from "smog." I've got a folder with examples like Briggs, Cornwell, Schaeffer, Whitore, even the usualy sunny Sundbloom. Photoshop levels and curves let someone try quick transformations into many moods and lighting conditions. Here in Hawaii our plein air group paints up and down the coast and you'd think that would be sufficient. And a lot of nice work comes of it, but generally the cool lighting is pretty consistent from 9-noon unless you inject some warm underpainting, or invent some reds. Otherwise it's blue sky, blue/green water, green plants and grey lava. It's when I get out and paint at dawn or sunset or imagine a nocturne that the results stand out. Another wider project I can see might emerge from your travels: using local palettes. Some western artists sell dried up, muted colors like "sage." In Hawaii I had to widen my gamut with the most intense cool lemons, aquas, and pinks. In Ohio the greens typically have a lot more red. I'll try to observe that more on our next trip there. James, you are just sooooo cool. Love the end of the video with the flip-out panels.